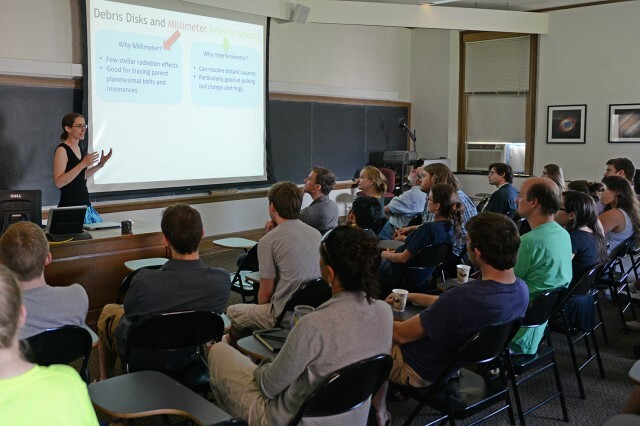 31 search results for "meredith hughes, assistant professor of "
Wesleyan astronomy students traveled to Vassar College Oct. 26-27 for the 24th Annual Undergraduate Research Symposium sponsored by the Keck Northeast Astronomy Consortium. KNAC is a group of eight colleges in New Jersey, New York and New England that have collaborated for decades to bring enhanced summer research opportunities to their students. 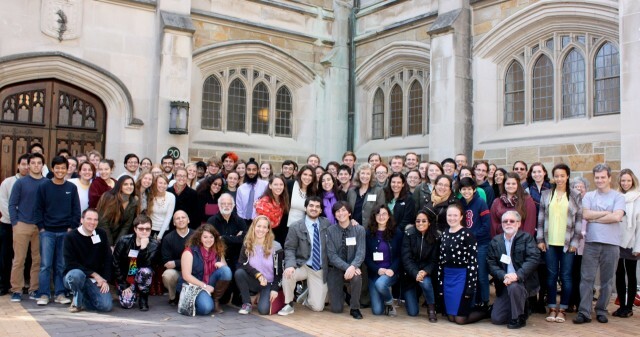 Pictured are the 85 students and faculty who attended the conference. Meredith Hughes was one of those kids drawn to science and nature. But growing up in small-town Rhode Island, she didn’t know any scientists. Little more than a year later, she was enrolled at Yale. 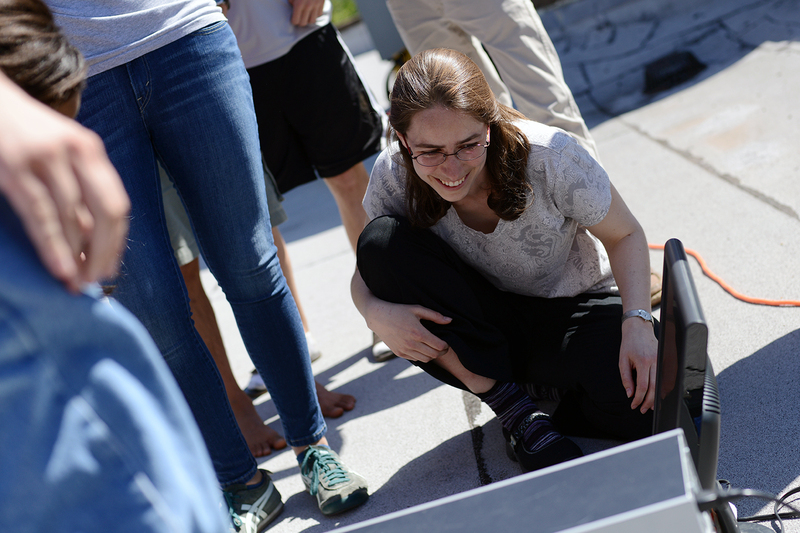 Despite the inroads into astrophysics she had made at SSP, she embraced the philosophy of a liberal arts education and spent her freshman year avoiding astronomy and instead exploring fields as diverse as cognitive science and music theory. 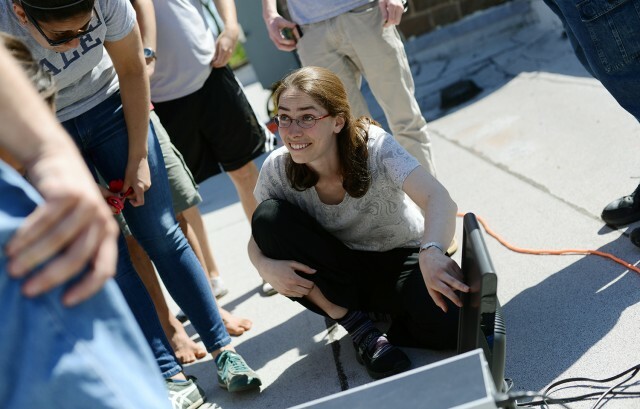 During the summer she had an opportunity to stay in New Haven and do astronomical research with Professor Meg Urry, director of the Yale Center for Astronomy and Astrophysics. Hughes found it exhilarating to apply the physics she had learned in the classroom to investigating the properties of the supermassive black holes at the centers of distant galaxies. “After that summer, I was hooked,” she said. 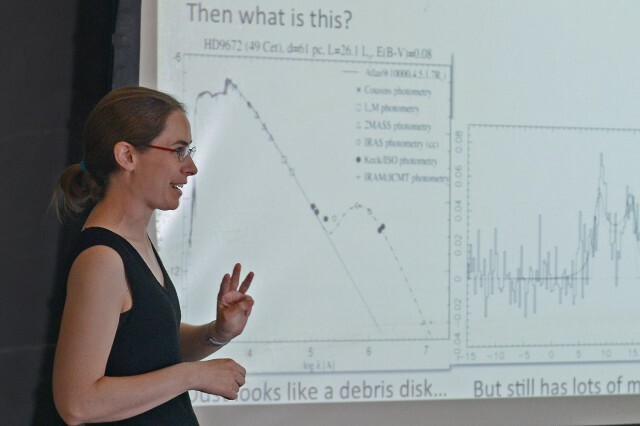 She went on to complete A.M. and Ph.D. degrees in astronomy at Harvard in 2007 and 2010, earning the department’s Fireman Fellowship for an outstanding Ph.D. thesis in the field of experimental astrophysics. Astronomy students and faculty celebrated the completion of a new small radio telescope (SRT) on May 1 during a ribbon-cutting ceremony. This is Wesleyan’s first radio telescope, joining three optical telescopes housed at the Van Vleck Observatory on Foss Hill. 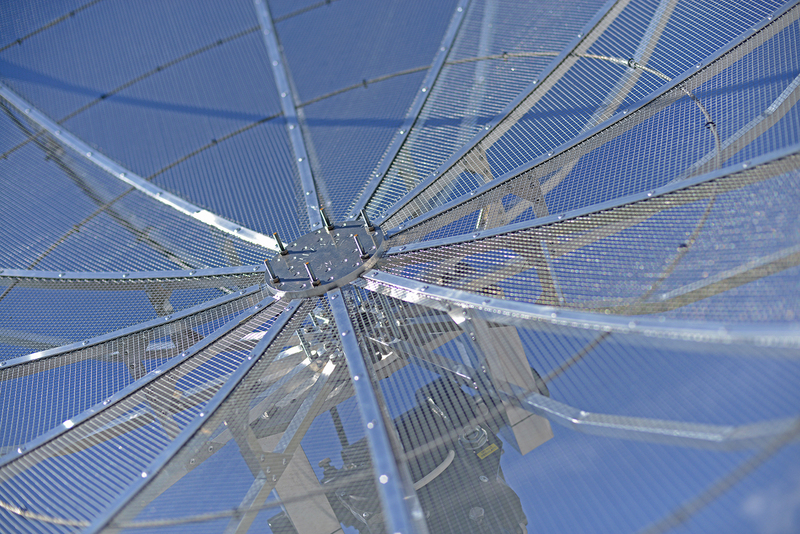 Radio telescopes are highly complementary to optical telescopes. Able to see through cloud cover, they are not limited by weather. 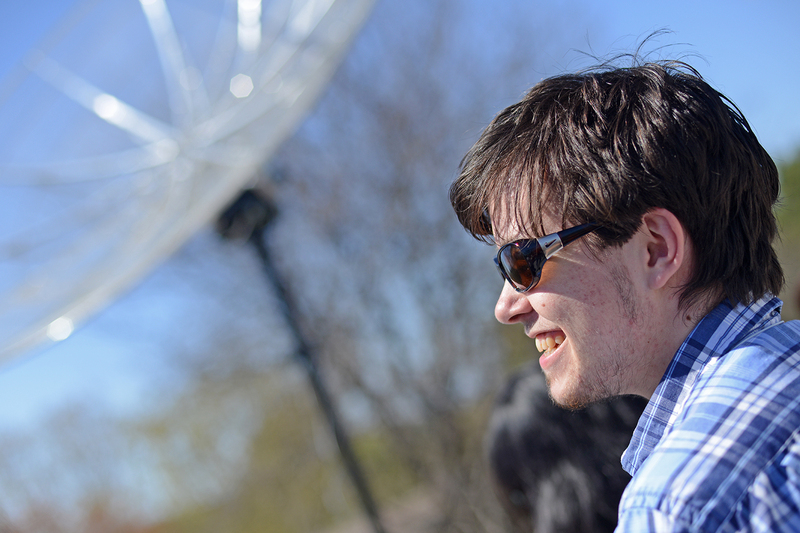 Also, in a “radio sky,” the remnants of exploding stars and distant supermassive black holes shine brightly. 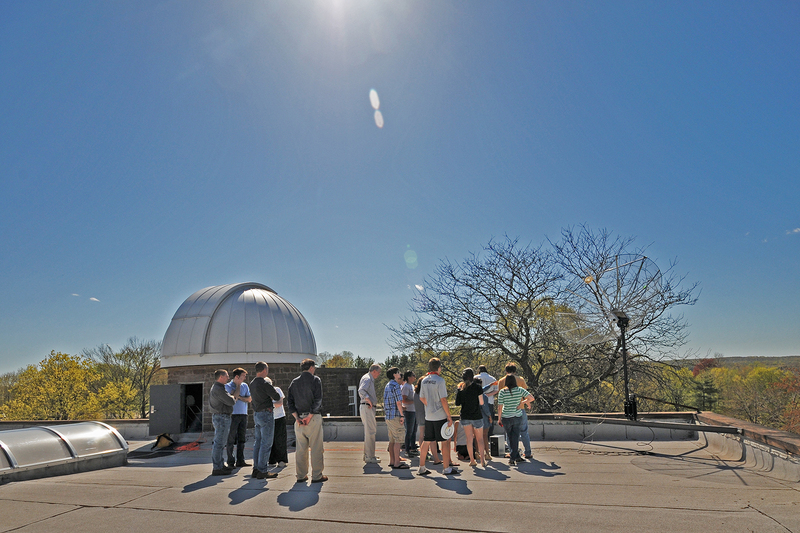 This fall, the SRT will allow Wesleyan students and faculty to detect remote radio sources, map galactic rotation and conduct other kinds of astronomical research. 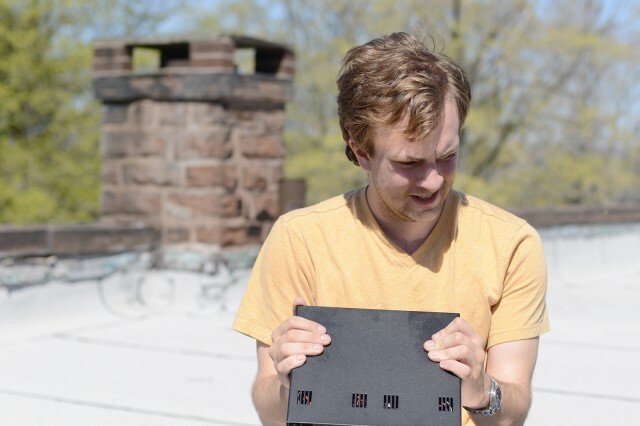 It will be an essential tool in the university’s astronomy courses. 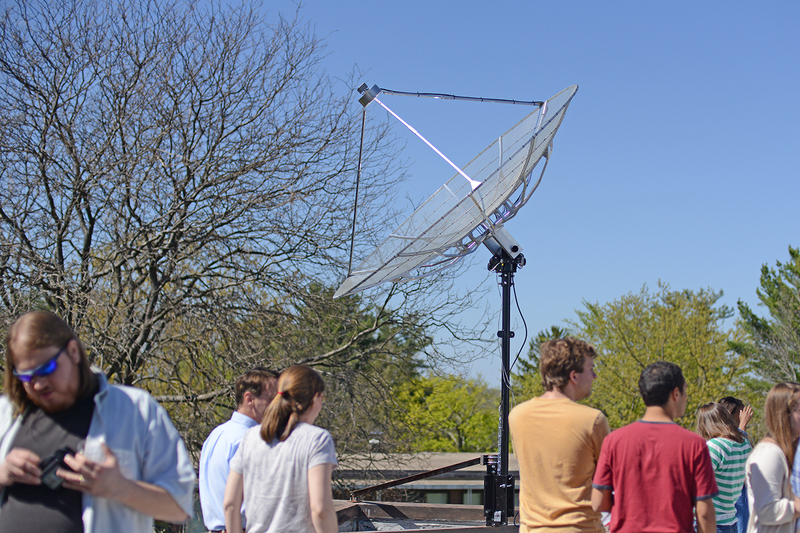 The SRT has a motorized arm that can position the dish to face any part of the sky. Quasars, pulsars, and the afterglow of the Big Bang have all been discoveries of radio astronomy. 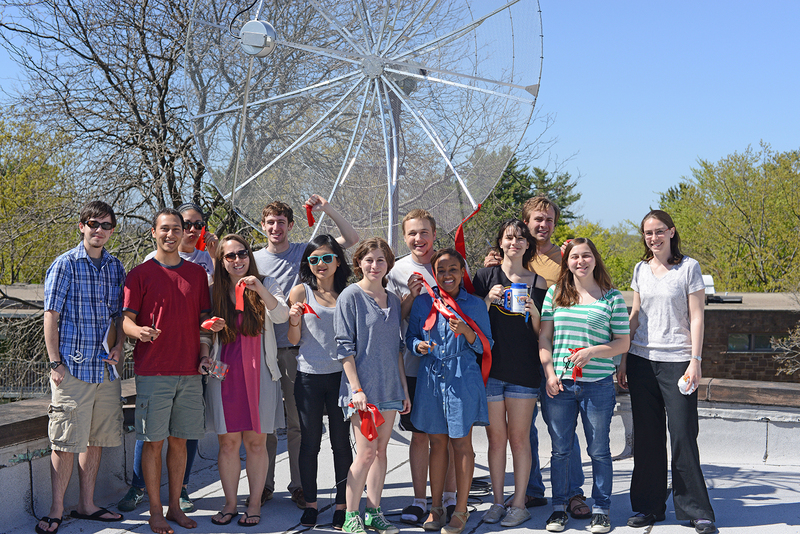 Students enrolled in Assistant Professor Meredith Hughes’ Radio Astronomy Class created the functional radio telescope in one semester. They followed design specifications for a small radio telescope developed by Alan Rogers at MIT’s Haystack Observatory. 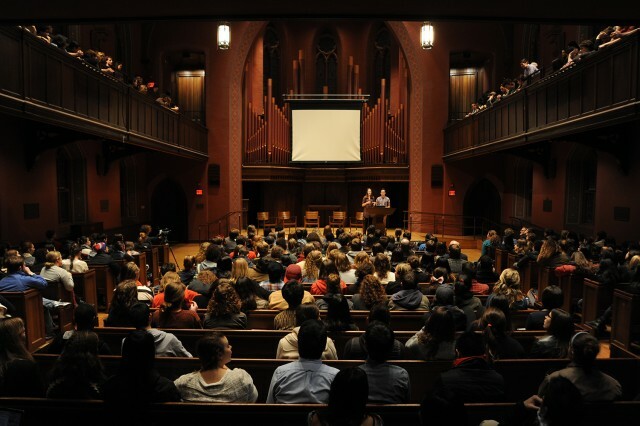 Wesleyan is the first university to assemble a SRT from upgraded system plans published by Haystack. 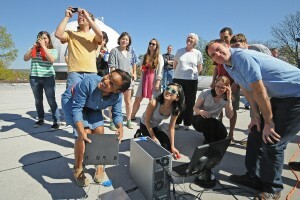 Hughes, pictured directing the satellite through a computer, divided her class into three teams. Each team was responsible for acquiring and assembling the components for different sections of the telescope. Of the 10 astronomers who have received Nobel prizes in astronomy, six used radio telescopes in their research. Classmates, with the help of Astronomy Department faculty, used the new device to detect the sun during a “First Light” celebration.